#31 "My Breakfast with Shane Matthews"
Every week, PJ Drummond sits down for breakfast and a chat with one of the stars from CHIKARA. Come for the conversation, stay for the danish! Episode: #31 "My Breakfast with Shane Matthews"
Description: This week, PJ Drummond sits down for breakfast with Shane Matthews! Your browser does not support the html5 audio player. Use flash player below. #30 "My Breakfast with Mr. Touchdown"
Episode: #30 "My Breakfast with Mr. Touchdown"
Description: This week, PJ Drummond sits down for breakfast with Mr. Touchdown, and it's good! #29 "My Breakfast with Sugar Dunkerton"
Episode: #29 "My Breakfast with Sugar Dunkerton"
Description: This week, PJ Drummond sits down for breakfast with Sugar Dunkerton! #28 "My Breakfast with Matt Jackson"
Episode: #28 "My Breakfast with Matt Jackson"
Description: This week, PJ Drummond sits down for breakfast with Matt Jackson! #27 "My Breakfast with Billy Kumohara"
Episode: #27 "My Breakfast with Billy Kumohara"
Description: This week, PJ Drummond sits down for breakfast with Billy Kumohara! #26 "My Breakfast with Derek Sabato"
Episode: #26 "My Breakfast with Derek Sabato"
Description: This week, PJ Drummond sits down for breakfast with Derek Sabato! #25 "My Breakfast with Brendan O'Donnell"
Episode: #25 "My Breakfast with Brendan O'Donnell"
Description: This week, PJ Drummond sits down for breakfast with Brendan O'Donnell! #24 "My Breakfast with Veronica"
Episode: #24 "My Breakfast with Veronica"
Description: This week, PJ Drummond sits down for breakfast with Veronica! #23 "My Breakfast with Grizzly Redwood"
Episode: #23 "My Breakfast with Grizzly Redwood"
Description: This week, PJ Drummond sits down for breakfast with Grizzly Redwood! #22 "My Breakfast with Portia Perez"
Episode: #22 "My Breakfast with Portia Perez"
Description: This week, PJ Drummond sits down for breakfast with Portia Perez! #21 "My Breakfast with Mike Quackenbush"
Episode: #21 "My Breakfast with Mike Quackenbush"
Description: This week, PJ Drummond sits down for breakfast with Mike Quackenbush! #20 "My Breakfast with Tom Filsinger"
Episode: #20 "My Breakfast with Tom Filsinger"
Description: This week, PJ Drummond sits down for breakfast with Tom Filsinger! #19 "My Breakfast with Dr. Keith"
Episode: #19 "My Breakfast with Dr. Keith"
Description: This week, PJ Drummond sits down for breakfast with Dr. Keith! #18 "My Breakfast with Gavin Loudspeaker"
Episode: #18 "My Breakfast with Gavin Loudspeaker"
Description: This week, PJ Drummond sits down for breakfast with CHIKARA's Ring Announcer and host of the Podcast-A-Go-Go, Gavin Loudspeaker! #17 "My Breakfast with Bryce Remsburg"
Episode: #17 "My Breakfast with Bryce Remsburg"
Description: This week, PJ Drummond sits down for breakfast with CHIKARA Senior Official, Bryce Remsburg! #16 "My Breakfast with Ophidian"
Episode: #16 "My Breakfast with Ophidian"
Description: This week, PJ Drummond sits down for breakfast with Ophidian! #15 "My Breakfast with Eddie Kingston"
Episode: #15 "My Breakfast with Eddie Kingston"
Description: This week, PJ Drummond sits down for breakfast with Eddie Kingston! 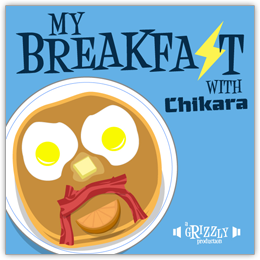 #14 "My Breakfast with Wiggly"
Episode: #14 "My Breakfast with Wiggly"
Description: This week, PJ Drummond sits down for breakfast with the first host of CHIKARA's Podcast-A-Go-Go, Wiggly! #13 "My Breakfast with Johnny Gargano"
Episode: #12 "My Breakfast with Johnny Gargano"
Description: This week, PJ Drummond sits down for breakfast with Johnny Gargano. #12 "My Breakfast with Billy Roc"
Episode: #12 "My Breakfast with Billy Roc"
Description: This week, PJ Drummond sits down for breakfast with Billy Roc.